Interference is one of the most common issues that mobile operators have to face. The root cause of insufficient performance can vary significantly, starting from factors that can’t be prevented by a field engineer, such as weather conditions, and ending with issues that can be easily altered with the right equipment in hand. Mobile operator Tele2 faced an issue with one of their links and chose SAF services for link troubleshooting. Tele2 Latvia has been one of the leading mobile operators in Latvia since the year 2000. With its headquarters in Stockholm, Sweden, Tele2 Latvia is part of a larger organization Tele2 AB Group which provides telecommunication services to more than 14 million customers in 9 European countries. Tele2 Latvia offers the fastest and broadest 4G coverage in Latvia making it available to 98% of the population. With more than 250 employees, Tele2 Latvia continuously works on expanding their infrastructure to offer high quality products and services. Tele2 had an issue with insufficient XPIC link performance that remained even after changing the equipment. The link was operating solely in 1+0 configuration and had a high BER value and experienced radio frame loss in its Horizontal polarization branch when XPIC was enabled. Since the equipment was not faulty, Tele2 in cooperation with SAF did advanced troubleshooting. Spectrum Compact is efficient and effective at the same time. The troubleshooting saved us time and was done from the ground level which made it exceptionally convenient for our field engineers. After some additional analysis, it was determined that this is most likely a problem with the radio transmission path. Due to its high sensitivity and compact form factor, Spectrum Compact was chosen as the most fitting tool to solve this issue. Troubleshooting was done from the ground level where, after doing the initial scan to verify the transmission frequencies on the tower, it was detected that there was a high and low radio violation. 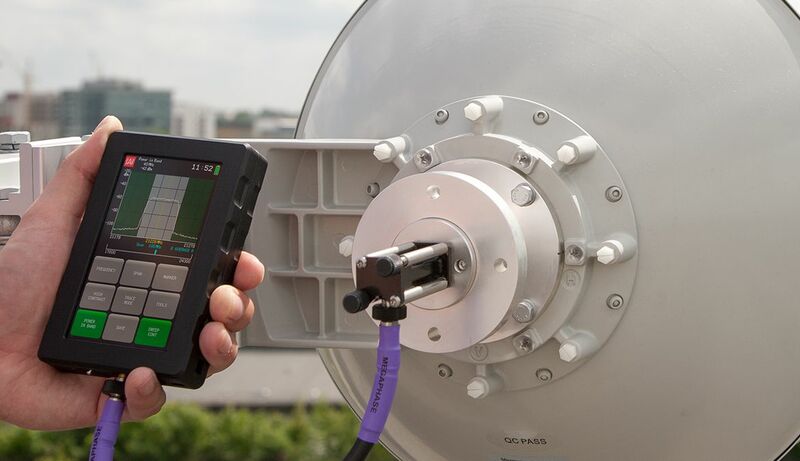 The cause of interference was a low side radio that was transmitting in the adjacent frequency channel to Tele2’s high side radio on the same tower, interfering testing link from the back side of the antenna. After detecting this problem, it was advised to switch the placement of high and low radios, which would resolve the issue completely. Thanks to the Spectrum Compact, this issue was resolved in a few hours.